Place-Making Intersections – People-friendly strategies for cars to drive slower, but travel faster! How to Drive Slower, But Travel Faster! How can a 5 or 7-lane “Stroad” be reinvented to catalyze walkable development, without also increasing delay and congestion for drivers? 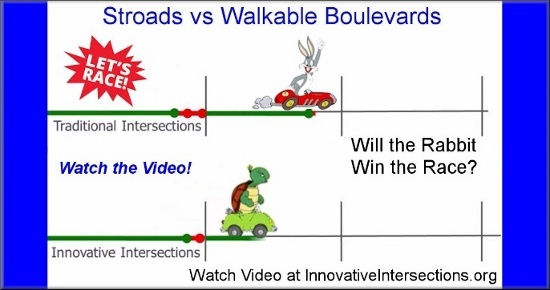 This conundrum is usually Win-Lose, where if walkability fans win, then drivers will lose, and vice versa. But there are several little-known intersection design strategies that can be Win-Win. This website and related sub-articles highlight those designs. This first article introduces the “Drive Slower, Travel Faster” opportunity which is common to Quadrant Intersections, Thru-Turn Intersections, and Town Center Couplet designs. All of these are similar to Continuous Flow Intersections and other Alternative Intersections, but have more Place-Making potential than CFIs. This article explains the math that planners and architects can use when working with engineers to reduce speeds without angering drivers. At the end are links to sub-articles detailing each design. Can the tortoise win the race? Watch the video before reading this article. 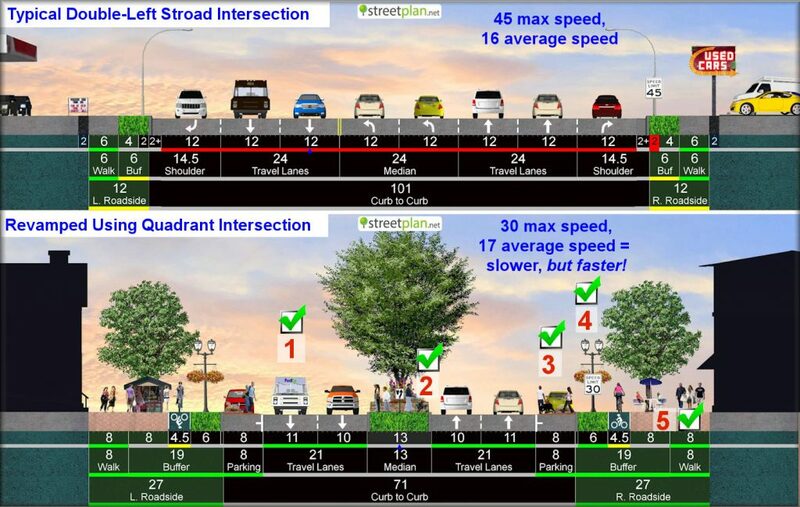 A “stroad” has fairly high-speed traffic, and is usually lined with auto-oriented land uses (a “street-road” combination). It almost always has 2, 3, or even 4 lanes each direction. Engineers build these trying to balance land access needs against high commuter volumes on fairly long trips. Communities want to reinvigorate these older, decaying, stroads as “Complete Street, Walkable Boulevards” with room for bikes, pedestrians, transit, and landscaping. But such stroads often have extreme congestion. If engineers and other stakeholders believe complete streets will make bad congestion even worse, then Place-making desires can end up hollowed out or just die with no political path forward. But now there are win-win strategies that can help turn stroads into walkable streets, while at the same time accommodating the same or even greater numbers of vehicles with less congestion. What’s the magic? It’s what I call “Place-Making Innovative Intersection” designs. If any of these are good fits for your situation, there’s a good chance you can shake hands with engineers rather than wrestle for the upper-hand. What if you could reduce speed limits, narrow lanes, or even eliminate a lane, and still give drivers faster average speeds? New opportunities for Complete Streets and spin-off Economic Development would emerge. But such wishful thinking is impossible, isn’t it? Turns out decades ago engineers invented many intersection designs that can handle more cars with the same number of lanes. Sounds like an auto-oriented solution, right? And that’s how engineers have tended to approach it. But some designs have features with amazing Place-Making potential. Engineers often install left-turn arrows for safety, but this creates a lot of inefficiency. The common-thread of all innovative intersections is to eliminate these left-turn phases. There are more than a dozen designs in the family. Some are irredeemably auto-oriented, such as the Continuous Flow Intersection. But the family also includes potential Place-Makers such as Quadrant Intersections, Town Center Intersections, and Thru-Turn Intersections for high-volume settings, and Roundabouts for mid-volume settings. A typical suburban intersection with left-turn arrows will get congested at fairly low volumes. You might wait more than 5-minutes, inching forward watching the signal turn red/green several times before you even reach the front of the line. Innovative intersection designs can often get the average wait at these signals down to a fraction of what it was before. So which is faster? Racing at 45 mph on a “stroad” only to wait 3-5 minutes at signals? Or a 30 mph boulevard where you wait just a minute or so at intersections? In this example, notice that it takes 20 fewer seconds to travel a half-mile at 45 mph than at 30 mph. However, the average wait at a signal along that stretch may be 25 seconds longer than with a design that eliminates left-turns at the main signal. In many cases, the “seconds stuck” can be far worse than this with traditional left-arrow intersections. So there’s your opportunity to “Drive Slower, but Travel Faster”. 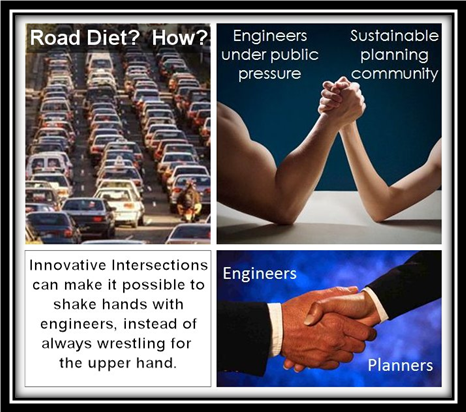 However, engineers usually don’t think about this, and instead use innovative intersections to keep cars driving fast, but traveling even faster! (Until induced demand slows everything again). Just engage them by showing them this website as a way to get maximum speeds down without impeding the drivers they’re defending. They’ll then analyze it, and may well concede that today’s situation would prove faster for drivers even if speed limits are reduced. Plus safety would improve at the same time. What’s not to love?! So use reductions in intersection delay made possible by innovative intersections as a bargaining chip for reducing the speed limit, narrowing lanes to 10 feet, and other traffic calming features. That’s what it means to drive slower, but travel faster. It’s win-win-win for autos, bike/ped, and economic development! Narrower lanes? I was trained that anything less than 12 will be unsafe. 10-11 might be ok if only drivers would slow down, but this isn’t a walkable area anyway so why would we want to slow traffic down? It’s not in the interest of the majority, so I wouldn’t recommend it. How do you turn left? Sure, the pedestrian realm is great, and there is a fantastic planted median with pedestrian refuge. But this landscape apparently comes by eliminating left turns! That would cause rebellion among drivers, who 90% of your voters! We MUST accommodate left-turns, and we MUST keep congestion at tolerable levels. On-Street Parking? Side friction from parking will reduce vehicle capacity. This is a busy corridor, and there are few alternative routes. Can we afford to lose capacity for on-street parking, when there is plenty of off-street parking? Reduced Speed Limit? The lower speed limit is safer for pedestrians, but there are virtually no pedestrians! It’s an enforcement problem and it will just make it take longer for the 90% to get around, so I wouldn’t recommend it. Where’s the money for this? We are fiscally weak. How are we supposed to raise money to construct then maintain all these amenities? Solving the Conundrum with Drive Slower, Travel Faster! Now say we show the engineer the same cross section, but this time tell him the design includes a Place-Making Intersection, in this case a Quadrant. Narrow Lanes: With less signal-induced delay, narrowing lanes to reduce maximum speeds will not reduce the overall average speed. Check! Left Turns: With lefts routed to less critical pathways and intersections, the previous double-lefts can be abandoned through the core of the Activity Center. Check! On-Street Parking: Parking always reduces lane efficiency, but the higher efficiency of the Quadrant could offset the losses caused by parking. This doesn’t mean engineers will accept on-street parking for every case, but it increases the odds. Quadrants also increase the odds of serving the same amount of traffic with fewer overall lanes. Check! Reduced Speed Limit: Since Quadrants allow you to reduce maximum speed without affecting average speed, it becomes easier to justify the traffic-calming features that will reduce maximum speeds. Check! Paying for it: Complete Streets add value to adjacent real estate. Combined with up-zoning and form-based codes, a proforma economic analysis of the likely effect could demonstrate ability to pay for this design and all its amenities using Tax Increment Financing or a PPP with the city, DOT, and a business association. By catalyzing infill otherwise bound for further out, it also reduces health costs and sprawl costs – arguments to use with candidate funding agencies. So, ought there be a way to pay for this? Check! Suburbs almost by definition tend to lack connectivity. What few through-streets exist become overwhelmed with traffic, degrading adjacent land-uses quickly. Many believe Complete Street retrofits would allow land uses to rebound, but it is daunting to create walkable, livable boulevards when high traffic volumes have no where else to go. StrongTowns: Are One-Way Streets Really That Bad? StrongTowns: Can One-Ways be a Middle Way for the Suburbs? StreetPlan.net is a a free Complete Street cross-section design tool sponsored by my company, Metro Analytics, where you can easily create cross sections like those shown above. 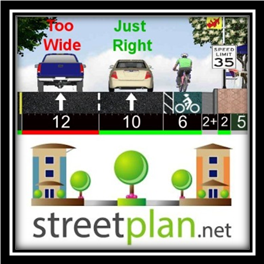 StreetPlan uses “red/yellow/green” to guide you through context-based best-practices for walkable streets supported by the Institute of Transportation Engineers, Congress for New Urbanism, and National Association of City Transportation Officials (ITE, CNU, and NACTO).